being assembled, launched and in the air. The Fieseler Fi 103, better known as V-1 from the German Vergeltungswaffe was an early cruise missile used during World War Two. The V-1 was developed by the German Luftwaffe during WW2. From 13 June 1944 to 29 March 1945, it was fired at population centres such as London. 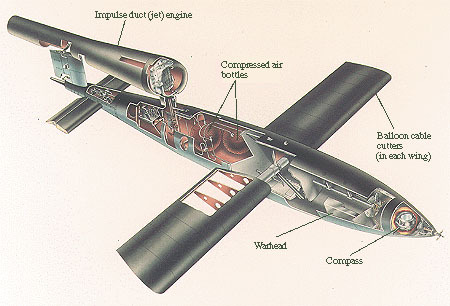 The V-1 was designed by Robert Lusser and Fritz Gosslau. The simple enginepulsed 50 times per second, and the characteristic buzzing sound gave rise to the colloquial names "buzz bomb" or doodlebug (after an Australian insect).